• Compatible with SteamVR games and already supports over 2,000 VR games. • “Inside-Out” tracking technology that does not require installing sensors on the walls; it is easy to set up and freer when playing games. • Top-lift mask so that they can simply be lifted to pause the game and return to reality. 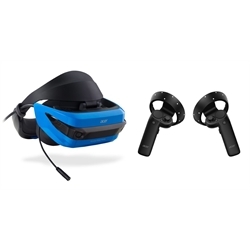 The beautiful and futuristic design of the Acer Windows Mixed Reality Headset offers the thrill of virtual reality with a phenomenal sense of presence, delivering experiences that are truly exhilarating. Fully compatible with 2,000+ VR games in SteamVR. There is no such thing as lack of gaming content.